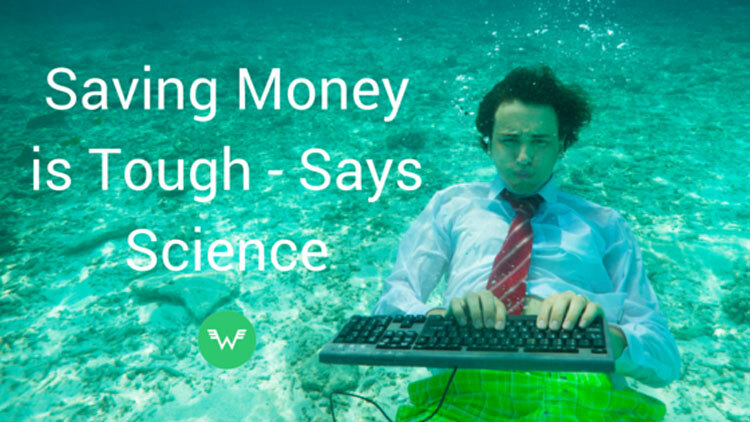 Saving Money Is Tough - Says Science. Been stressing because you know saving money is really important but you struggle with it? Don't worry, you're not alone. There's a good reason for it. It's called the Endowment Effect. Let's start with a simple definition - The accountant's Wikipedia; "Investopedia," defines the Endowment Effect as: "A circumstance in which an individual values something which they already own MORE than something which they do not yet own. Sometimes referred to as divestiture aversion, the perceived greater value occurs merely because the individual possesses the object in question." Basically, if we were applying this theory to real life situations, I value my one Krispy Kreme original glazed doughnut MORE than the assorted six pack of chocolate krispy kremes I can have in a week, because my original glazed is here, in my hand, now? OK, got it. But what does that actually mean? As Investopedia continues, there's an interesting psychology behind this theory - "A bird in the hand is worth two in the bush." This basically means that, it doesn't matter what the object is, it could be one of those crappy nail files from a Christmas cracker, or it could be financial inheritance from a dead relative (may they rest in peace)? Studies have shown repeatedly that people will value something that they already own more than a similar item they do not. Simple. There's a well documented study that demonstrates this, whereby a professor in America taught a class of students on the Monday/Wednesday of a week, and a different class on the Tuesday/Thursday of a week. To the Monday and Wednesday students he gave a mug with the university logo on it, to the Tuesday and Thursday class he gave nothing. A few weeks later he asked the Monday and Wednesday class to put a price on the mug, and did the same for the Tuesday Thursday class. The results? Unsurprisingly, the Monday/Wednesday group valued the mug as significantly higher than the Tuesday/Thursday group. This is the best explanation and example of the endowment effect in action, and it makes sense. We are creatures of familiarity, we value what we have in the present, right here and now. It isn't natural for us to plan ahead and weigh things up based on a premise of "oh that'll be useful in a few years time" or "I'll need that in place for when I go on the round-the-world trip with my degenerate mates." Personally, I'm worried more about what I'm having for dinner and whether the 2016 Soundwave Festival is going to go ahead than any of that sort of stuff. The future will sort itself out. Right? Maybe. Maybe not. "OK, still got it. But how does understanding all of that help me?" Like the krispy kreme and the crappy nail files from the christmas cracker, we value the money we have right here and right now. I don't know about you, but I'm sure I'm not over-egging the omelette when I say this can make it awfully difficult to save. Save Often. The more often you do something, the more natural it becomes. The more natural it becomes, the easier it becomes. By saving often, you're training your brain to not subconsciously view putting money aside as some form of evil plot against your current self. And by taking it slowly, you're at far less risk of extreme behaviour which only serves to de-motivate you (crash dieting anyone?). Save little amounts. Because you're now saving often, you only need to save little amounts. Think about it. If you set yourself a savings goal of $1,000 by next Christmas and planned to drop $250 in your savings account once every 3 months. Reckon you'll hit that target? But what if you could effortlessly put $20 in each week. Much easier. Save without thinking about it. If the biggest issue with the Endowment Effect is the feeling that by setting money aside for future use you're somehow losing something now, take that out of the equation - by automatically saving (small amounts, often), you no longer have to think (stress) about starting something that you know (yes, you know it) will have life changing impacts. So now you understand why saving money is more difficult to put into practice than it should be. And now you and have some simple tools to do something about it. So I guess the only question that remains is - what are you saving for? Blessed with a pioneering spirit and want to join the movement and help us build WealthNation? sign up here.